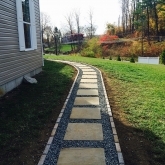 Are you looking to build a new stone wall, pathway or fireplace? What about an old stone structure that needs to be repaired. 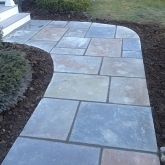 Roots Landscaping offers professional masonry services to homeowners and businesses in Brookfield. We build beautiful stone and brick work that is built to last. 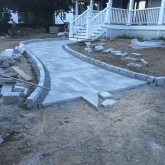 Roots Landscaping provides professional masonry services for your residential and commercial properties. 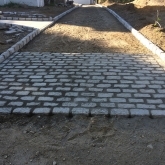 At Roots Landscaping, we like to think of Masonry as an art, priding ourselves in the careful collaboration of stone and brick projects, the most common type of material used in Masonry. 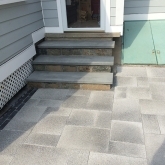 Our professionals are here to help you build your dream patio, steps and much more with our experience, expertise and dedication. If you check out Google Reviews, Yelp, Angie’s List, etc., Roots Landscaping will always come up as the top-rated. It’s because we are dedicated to our clients and strive to provide the highest quality work at the best price. We want your business for life, and will work on every project to make it a reality. There are hundreds of stone and brick choices to make your home your own. To make your decision a bit easier, we’ve included some popular stone types that we install regularly. If there is a stone that you would like us to use, simply tell us the type and we will source it for you. As always, our experts work with you to choose stone that will compliment your land as well as your taste. The structural integrity of masonry deteriorates over time as the ground underneath shifts and the natural elements of nature contribute to masonry damage. Rain deals significant damage to the mortar of your masonry wall, which begins to crumble and cracks begin to appear on the walls. If kept damaged, the mortar of these cracks start to get bigger, and the mortar begins to fall out, which considerably drops your house’s aesthetic appeal and its market value. 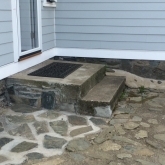 Roots Landscaping can help residents in Brookfield uplift their masonry and repair these damages. 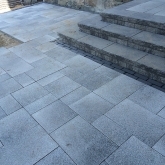 At Roots Landscaping, we provide commercial clients with a plethora of masonry installation, restoration, and repair services. Our professionals will sit down with you to discuss exactly what you’d like. After helping you choose the right brick or stone, you can leave the rest to our professional contractors. 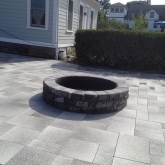 Roots Landscaping provides top-rated masonry installation, restoration and repairs in Brookfield, CT. If you would like to learn more about our company, services, and team, contact Roots Landscaping today. In addition, we also provide expert fencing and landscaping services. If you are interested in either or all of these services, call us today at 203-304-7326.